In this tutorial, we will show you how to apply a set of corrections and effects to a series of photos. You will learn how to batch process an entire series of images by working on a representative image, and then you will learn how to create a preset so you can save corrections and apply them to other photos later on. 1 – Why batch-process photos? 1- Why batch-process photos ? Whether in the context of professional reportage or vacation photos, each photo session usually ends with a fairly large number of photos to process. Since many photos in a series will have been shot under the same lighting conditions, you will save time by applying the same corrections to the entire series all at once, rather than manually applying the same corrections to each photo one at a time. You can also use batch processing to apply an original overall rendering or look to all of your photos. Depending on the kind of settings that you want to apply, you should make sure that you are working with a series of images shot under largely uniform conditions. For example, if you manually correct the exposure for a single image, it is unlikely that this correction will be relevant for shots taken under different lighting conditions. You should also avoid processing other photos using settings that are specific to correcting just one image — for example, an image that is strongly back-lit. 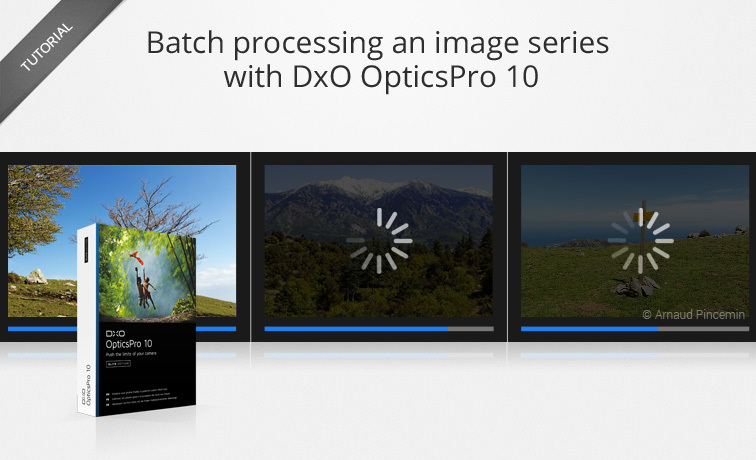 DxO OpticsPro is particularly suited to batch processing images. In fact, with certain functions such as Exposure compensationand DxO Smart Lighting, the software measures the exposure and analyzes the contents of each image in order to apply the best possible correction. So the settings for these two corrections (which are part of the DxO default preset automatically applied to every photo) will provide different values for each individual photo so as to obtain the best results for each one. icon in the image thumbnail. Don’t forget to take advantage of the Organize tab’s notation, filter, and sorting capabilities when you want to accurately display a selection of images. With a homogenous series, as is the case here, you use any the photos to define your processing settings. 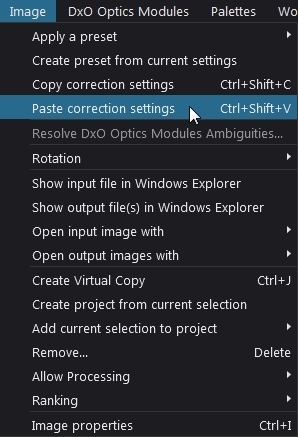 When you open the image in DxO OpticsPro, the DxO default preset is automatically applied. On top of the default corrections, in the Light and Color > Contrast sub-palette, apply a Contrast correction of +10 and a Microcontrast correction of +60 to improve the overall rendering. In the Light and Color > Color accentuation sub-palette, boost the Vibrancy to +20 and the Saturation to +5 to enhance the colors, particularly the blue of the sky. You will need to copy and save the corrections for the reference photo to be able to apply them to the other images in the series. Temporarily save the corrections applied to the reference photo by choosing Copy correction settings in the Image menu (keyboard shortcut: Ctrl + Shift + C on a PC or Cmd + Shift + C on a Mac). So long as DxO OpticsPro is still open and you don’t select this function again, the settings will remain copied (i.e., temporarily saved). In the image browser, select the photos to which you want to apply these same settings. In the Image menu, select Paste correction settings (keyboard shortcut: Ctrl + Shift + V on a PC or Cmd + shift + V on a Mac) to apply the copied settings. All of the photos in the series have been corrected in just a few clicks!gs. After applying these settings, we advise you to look at each photo to make sure the rendering is what you expected. You can adjust the settings on a case-by-case basis if need be. As indicated in the preceding section, saving the correction settings by using the Copy correction settings command is temporary and cannot be used to apply the same settings to another batch of images later on. We will now show you how to permanently save your set of custom corrections. We will start at the same place as in the first part: first we will select a representative image from our series which we will use to define our correction settings for the entire batch. Just as before, the DxO default preset is applied automatically, and we will once again add contrast and color corrections. Depending on the series of images that you process, you can also add other relevant corrections (for example, noise reduction for a series shot at high ISO). After you have applied all of the corrections that you want to your reference image, go to the Image menu and choose Create preset from current settings. A dialog box will open in which you will need to enter a name for your preset and indicate where you want to save it. 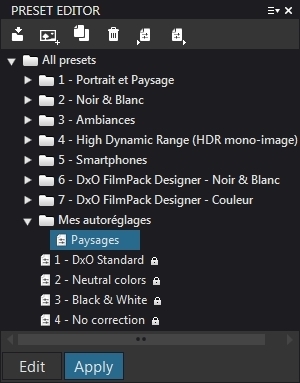 To help you find your presets more easily, we advise you to create a dedicated folder for your own custom presets, and to give each preset an explicit name to help you remember what it does. DxO Optics Pro will group your custom presets in a dedicated sub-menu. 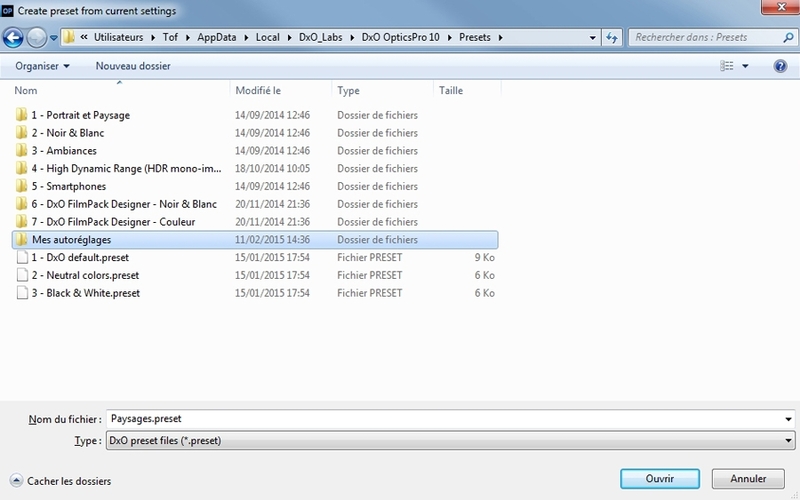 To verify that your preset has been saved in the folder that you’ve selected, open the Preset Editor (by default, in the pane to the left of the display area) and look through your folder(s) to find your preset. After you’ve saved the preset, its correction settings are available to use whenever you want. 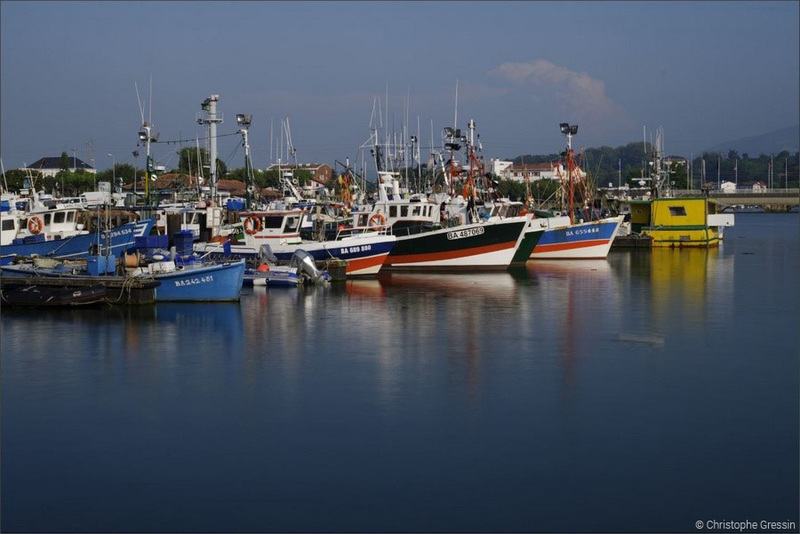 To apply your preset to a series of images, start by selecting all the images in the image browser that you want to correct., and then go to the Preset menu and apply the preset saved in your custom presets folder. If you want, you can examine the photos in your series to see how the preset looks for each one, and fine-tune the settings on a case-by-case basis if need be. One especially interesting benefit of presets is being able to create and use them to systematically correct or suppress the dust specks on your sensor and/or lens that mar all the photos you shoot. Here’s how to automatically remove dust specks: First, take a photo of a unified color field (e.g., a clear sky, a plain wall, etc.) while closing the lens diaphragm as much as possible. This will increase the depth of field and thus show all of the dust specks. This photo will serve as your photo of reference. Then use the Dust tool in the Detail palette to remove the dust specks. After you’ve gotten rid of the specks, save the correction settings as a new preset (per section 3 above). This means you can get rid of all your dust specks even before you have time to clean your sensor!